When I decided to live in an RV, I did a lot of research. I looked at YouTube videos and read a multitude of blogs and RV Living websites (Click here to view my favorites). Then I visited a couple RV dealers to see what’s available and pick the sales persons’ brains, knowing they’d be eager to make a sale and would spend a ton of time educating me. It was free training! I also started scanning Craigslist to see what was available and how much they were. I began my search in February, which, it turned out, is a good time. 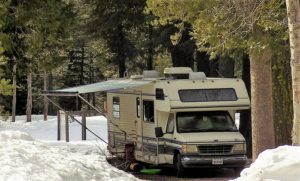 No one is looking to buy an RV in the winter and spring, so the prices are a little better and sellers more willing to negotiate. What are your RV Living Needs? 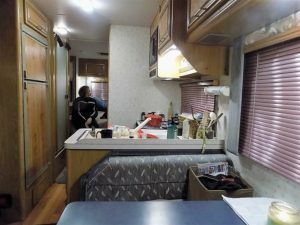 Kitchen area of 1993 Class C RV. Notice the pink blinds! They were the first to go. For me, room to work and live with an 11 year old, 55 pound dog (Capone), who sleeps with me was a big consideration (sleeping in a cab-over wasn’t an option). While the whole idea of RV living was to be outside more, I knew I’d be inside working a lot and wanted a separate work/sleep space. I’m also vegan and love to cook, therefore a full kitchen was a must for me. Storage was also a big consideration. I sold everything I owned and didn’t want to pay for storage so all my worldly possessions needed to fit inside my RV (honestly it was just a few storage bins of stuff), Furthermore, because I wanted to start my new life debt free, I had a $10,000 cash budget. 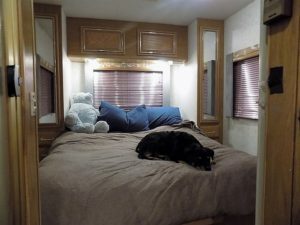 What Size RV is Right for You? For these reasons, RVs smaller than 25′ didn’t really appeal to me at the time. 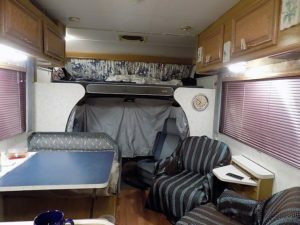 With my space requirements and budget in mind, I searched for Class A and Class C RVs no larger than 30′. Many RV Parks and Campgrounds only accommodate RVs less than 30′. In fact, a smaller RV would also manage well on the forest roads and remote places I wanted to go. 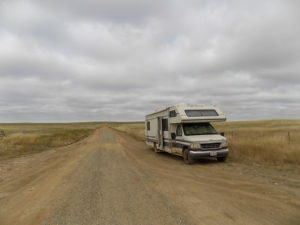 Should You Live in a Class A, Class B or Class C RV? Finally, I settled on a Class C RV. The Class As felt too big and bulky and I liked the truck chassis of the Class C. My thinking was that it would be more versatile for the types of roads I’d be driving. Buying an RV to live in takes patience! After several weeks of looking and test driving I found my 1993 29′ Jamboree Rallye with a Ford E350 motor. It had 54,000 miles on it, no water damage that I could see, seemed to drive well, had new laminate floors, was clean and in overall pretty good condition for a 23 year old rig. I inspected it with my untrained eye: the engine compartment looked clean, the hoses were newer and there were no leaks that I could detect. When I test drove it, it seemed to have more power and a smoother ride than others I’d tested. I also tested the house water pump, refrigerator, stove and generator and they all worked well. I really liked the couple I bought it from; they were only the second owners and had owned it for 5 years. They took it out a couple times a year. Before turning it over to me, they smogged it (California) and installed new front brakes. I knew I’d have to replace the tires soon. The tread was good, but they were old an cracked. Further, they told me the truck A/C needed to be recharged. They were asking $9,000, I paid $8,000. Dinette and seating area before the remodel.. I at least covered the ugly 1993 chairs! I believe the owners told me everything they new about the RV and weren’t trying to pull the wool over my eyes in any way. They just didn’t know. They only drove it a few hundred miles a couple times a year and probably figured they didn’t need to do a bunch of maintenance on it. Had I known ahead of time all that it needed, I could have offered less or continued looking. – Lesson learned. 1. I would have bought a smaller RV- My goal was to live in remote places and be outside more. My 29′ Class C RV is a little too big to take on some roads and I have more than enough living space and storage. After living in it for 3 months, I’m really wishing I had something smaller and more versatile. I could have gone with a 25′ RV. 2. 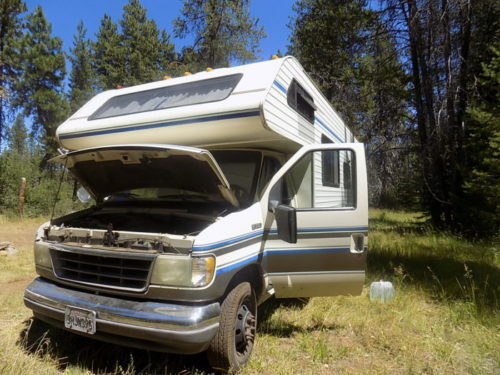 I would have taken it to a mechanic before buying it – Being a 23 year old RV, I knew I’d have to put some money into it and I budgeted for that. But knowing WHAT I’d have to repair would have given me much needed peace of mind. Every time I took it out the first few months, I lived in fear of breaking down on some country road in the middle of nowhere. Knowing what was likely to break (and when) would have been comforting and allowed me to budget better. 3. I would have test drove some newer ones – I only test drove three or four 20+ year old RVs. Since I’d never driven an RV before, I had no idea how it should feel or sound. Had I known, I might have been able to detect some of the problems it had (a bad catalytic converter, for example). Test driving something newer might have given me a baseline for how it should feel to drive one. RV Living on the open road! 4. I would have checked ALL the fluids before purchasing (not just the oil)– This would have clued me into how well the previous owner maintained the RV. He gave me a huge folder of records that I mistakenly assumed were maintenance records. They weren’t. And the RV was dry of almost all fluids. Not good for the RV and a sign that it wasn’t maintained. 5. I would’ve understood that low mileage doesn’t necessarily mean an RV is in good shape – RVs need to be driven. The longer they sit the more things dry up and crack. If I had to do it over again, I’d ask if it was stored inside or outside, how much it was driven and how often routine maintenance was done. If the owner doesn’t know this and doesn’t have records, I’d either take it to a mechanic before purchasing or keep looking. 6. I would have test drove it more rigorously – I’d have taken it on the freeway and I would have found a big hill to drive it up. It was very loud when I gave it a lot of gas and would lose a lot of power – clear signs that something was wrong (the Catalytic Converter was bad). In November 2017, I’d had enough. I bought a new RV. If you want to see all the trials and tribulations I had with my first RV Matilda, watch them here. To see my new RV, Phoenix, click here. I’ve been in my newer 2005 Winnebago Itasca Spirit over a year and I’m loving her. She’s been a great RV so far! To read more about how to find an RV to Live in, click here. What Motorhome Should You Live In? Shop RV Supplies and More! Many of you have asked to be able to make a one-time contribution option, rather than the monthly membership of Patreon. 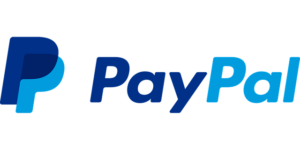 You can help me keep making free videos and blogs for everyone by contributing via PayPal by credit card. Thank you!